More Grackle, Less Grackle. What's Your HEB? Happy Hour & A Playground. Family Fun! The Seaholm Trader Joe’s is opening today, right on schedule. They’ve got specials and balloons, according to reports, so I don’t see how you can resist. In unrelated news, Whole Foods is having a sale at their downtown location. Today only you’ll get 20% off any of their 365 Everyday Value products. 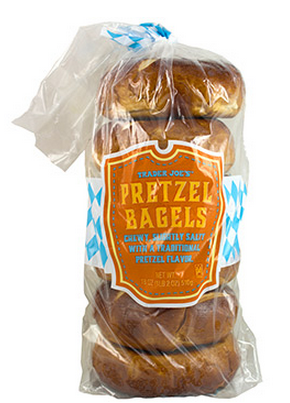 These products range from almond butter to granola bars, vitamins to frozen vegetables. Even organic milk! So this is a pretty broad sale. Stock the pantry up and enjoy the price wars! Finally, a new Fearless Flyer. A whole new crop of products to mock, and as always, with helpful Victorian Graphics! Dancing? Or fighting? Is there a difference? 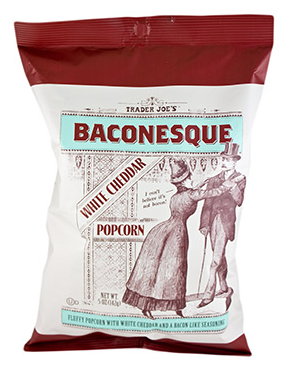 This is 5oz of no-bacon-but-still-baconish and cheese popcorn, for $1.99. In the realm of snack food, this isn’t the most you’ll pay for puffy salty carbs, but given popcorn you’d make in your house is an order of magnitude cheaper this stuff better be really bacon cheesetastic. Which seems unlikely, given that there isn’t any bacon, just ‘bacon-ish natural smoke flavor’. So that vegetarians can get their bacon fix, I suppose. The best part of the description is the mash-up quote from a Beggin’ Strips/I Can’t Believe It’s Not Butter commercial, where TJ’s thinks this product might have you saying, “I can’t believe it’s not bacon!” (And whoa! check out the hair on that pups mom! and that FONT. Lord.) Because what you want to reference, when talking about your yummy snack food, is dog treat commercials from days of yore. That’s basic good sense, right there. Next we’ll see Chex Mix commercials using the Meow Mix theme song, but with the word ‘Chex’ instead of ‘Meow’. Chex chex chex chex, Chex chex chex chex, Chex, chex chex chex CHEX chex chex chex. I’m not gonna lie. I might buy this one, if only to poll the citizenry of Chez Cheepie to see if this snack does taste like the promised bacon. And so we can all just randomly bust out, “IT’S BACON!! !” as the feeling moves us. This week the main silly thing is a recipe. The photo they’ve got wit h this recipe immediately cracked me up. Knock-off Goldfish, knock-off Ritz Bits sandwiches, knock-off Cheerios….this looks like a kid went into the pantry and decided he’s just gonna eat it ALL. But first, he’s going to take a page from Granny, and Chex-Mixify it with some onion dip powder, butter, and soy sauce, because what salty snacks are known to be lacking is more salt. 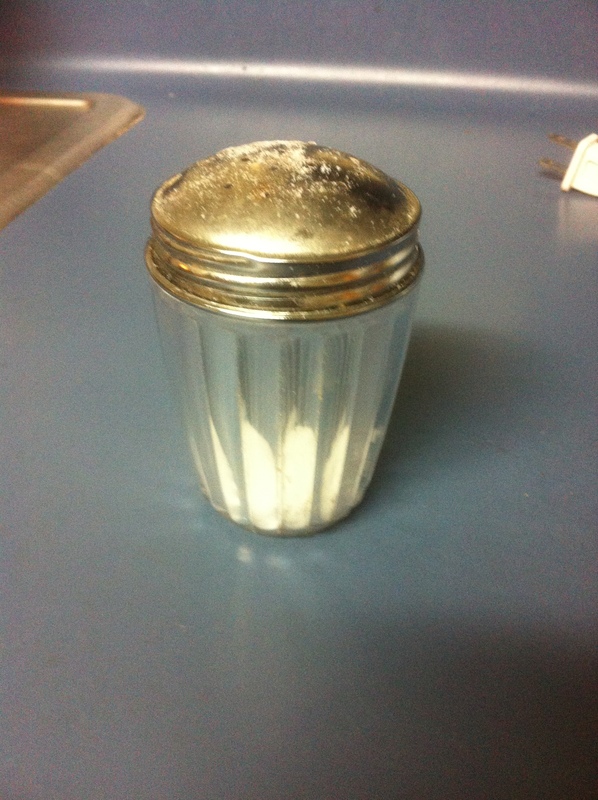 I don’t think they even did that part of the recipe for the photo. I’m no photo stylist, but none of those things in the bowl look like they’ve been lightly tossed with a salt/butter slurry. The recipe section did have some good-looking items, and I think I’ll try the chicken and waffle bites next time I have people over. I mean, I’m not going to use frozen gluten-free waffles, but I’ll follow the general idea. The chicken will also not be frozen nuggets. I guess I’m just a fan of their plan to put food on sticks. Grocery Theory post tomorrow. Cheep Cheep! This looks innocuous, right? Cheepie, why are you picking on oatmeal, right? Oatmeal is nutritious, cheap, and while not meant for Texas summers, is an excellent all-round foodstuff. Why, Cheepie? Because this oatmeal is frozen. I’m not sure I need to explain further, but I will. Because this is a blog, and I’m supposed to write the amusing words to make my bar graphs happy when I check them. Not that I’m doing that. Hourly. Much. Frozen oatmeal. Oatmeal, which is already available processed in a variety of ways to accommodate your cooking needs, is now pre-cooked and frozen. So you can pay for the water and time they boiled into it. Here’s where it gets brilliant: the “perfect porridge” is flash-frozen into individual, bowl-sized servings. 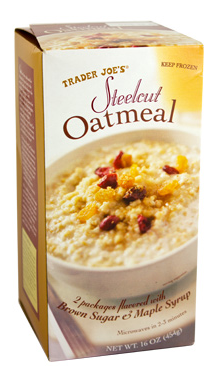 Just three minutes in the microwave, and you can be sitting pretty with a “just right” bowl of our Steelcut Oatmeal. The price is right at $1.69 for each 16 ounce (2 serving) box. For all I know frozen oatmeal has always been there next to the frozen biscuits and frozen waffles. But I don’t think so. I think this is new, and we all know new is weird. Well, I know that, and as Queen of This Blog I’m calling it weird. Steel cut oats are a thing that you’ve got to plan ahead for, but we’re Cheepsters, and thinking ahead to put oats in a crockpot if steel cut oats is what we must do, then we’ve got the skills needed. Especially since Bob’s Red Mill, a place that has a great product but is not usually the cheapest, will sell you 24oz of oats for $2.99. That’s 15 servings, making the frozen TJ’s option of 85c/serving seem deserving of this week’s post. Even if you don’t plan ahead, in 20 min you can have your 20c serving ready–and at this point you might be thinking, come on, it’s difference of 65c! That’s nothing. But, if you’re serving three people this meal just once a week? That’s over $100 in a year, and you know that $100 can get you 50lbs of meat if you shop the sales. 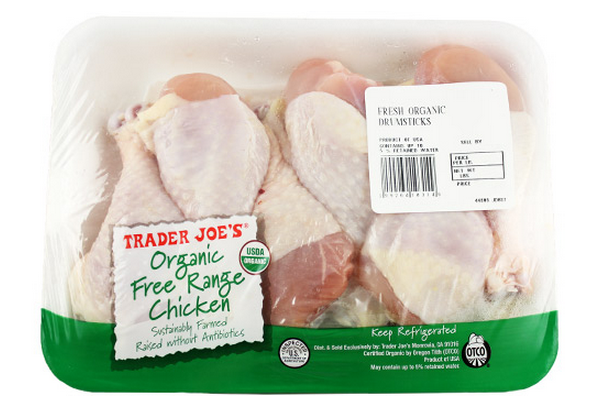 Frozen foods can be convenient, and they can be cheap. Frozen vegetables have actually gotten my kids eating more vegetables than they used to. This item is the former, but isn’t the latter, especially given the many varieties of oatmeal out there. Time is money. But just 20 minutes on oatmeal days to save enough money for months of meat is the kind of grocery math I do. Chorizo is a many-defined thing. It can be splendorous, and it can be a weird plastic tube of salivary glands and seasoning that you’re supposed to smush out into a hot pan and hope for the best. Traditionally, a sausage is a way to use up the random bits left over after you’ve secured the good cuts–the little trims, possibly organs (hello boudin! ), cheek meat (before it became popular) and whatever else seemed like a good plan at the time. Chorizo seasoning is a peppery paprika blend of things that is, to me, the downright best part of a breakfast taco. It’s bullish enough to cover a multitude of sins, including organ meat that might otherwise be thought a slippery greasy mess, but only if that mess is balanced with actual meat that has texture. I am here to tell you that it’s not always the case that the chorizo makers that make the products available in the store have followed my simple rule. Ever thrown out a pan of food? Go ahead and buy the cheapest chorizo at the market. Squish it into the pan, and tell me if you decided to crack eggs over that, or toss it and hit Taco Cabana. I’ve got an iron stomach, and even typing that brings back images that do not make Cheepie happy. Which is why, for a change, I’m liking my Silly Thing this week. Cheap chorizo should obviously be soy–it’s hugely assertively seasoned, the cheap bits that used to make it are now much pricier, and all we’re doing is mixing it into tacos. This isn’t Spanish chorizo, for slicing on a pretty cheese plate–this is Mexican chorizo that is not even a sausage except for that people keep putting it in plastic tubes! Why do we do that? A grocery mystery. I’m not giving up on meat chorizo, but at $1.99 for 12oz, you’re going to have enough to make extra tacos for the freezer, which will save you one morning from the Krispy Kreme. Pork chorizo costs twice that or more, and it’s good, too. It’s just not my funny thing this week. Soy Chorizo, for when you’re all done with salivary glands and paprika!